Dr. Jaclyn Hutchins is a licensed optometrist and certified glaucoma specialist in Texas. 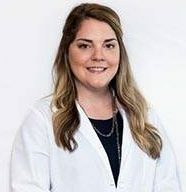 A native of South Texas, Dr. Hutchins completed her undergraduate degree at Texas A&M Corpus Christi and doctorate at the University of Houston College of Optometry (UHCO), where she graduated with honors. While completing her doctorate degree she achieved student fellowship status from the American Academy of Optometry and received numerous Clinical Letters of Excellence from the UHCO faculty. Dr. Hutchins is a member of the Bexar County District Optometric Society, the American Optometric Association, and the Texas Optometric Association serving on the New Graduate Task Force. She is trained in diabetic eye care, glaucoma, dry eye, allergies, infections, and injuries. She specializes in pre and post operative care of surgical patients including LASIK, PRK, cataract, INTACS, and pterygium removal. She loves providing eye care to all ages, infants to geriatrics and is part of the Infant See program, providing free eye exams to infants 6-12 months old.